There are two versions about the name of the place. Harida Maharishi performed Tapas for many years. The rishi was overwhelmed when the Lord revealed His form and composed the Srisukthi (Tirumozhi) dealing the Varnashrama Dharma, Anushtana Prakarana (duties to be performed at five times a day) and samhita (which deals with yoga) and hence the place is called Tirumozhikalam and the Lord took the name Tirumozhikalathan at the request of the rishi. The natives call the Lord as Lakshmana. As per sthala purana, Lakshmana prayed this Lord repenting his action of suspecting Bharata when he came to Chitrakootam and was overwhelmed by the embrace of Lakshmana. Since this sthala brought back the comradeship between the two, this place is called Tirumoozhikalam. This place is about 24 kms from Alappuzha (Alwaye) by road on way to Ernakulam, and about 5 kms from Angamali Railway station on the Ernakulam - Allapuzha Line. Theertham - Perungulam, Sanga Theertham, Chirraaru. The Moolavar of this sthalam is Muuzhikalathan. 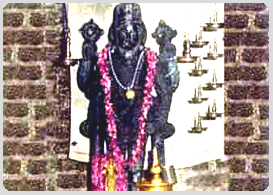 The Perumal is also named as Appan, Sri Sukthinathapperumal. He is found in Nindra thirukkolam facing his thirumugham along the Eastern direction. Prathyaksham for Aareetha Maharishi. This sthalam is situated near Aalvaai city in Kerala state. We can get down in Aalvaai and from there, we can reach Moozhikkalam by travelling in the bus. From Ernakulam also, we can reach this sthalam by bus. To get into this sthalam, we have to travel about 1 Km from Moozhikkalam road. From Kaaladi road railway station, if we travel 7 kms towards the western direction, we can reach this sthalam. There is not much of lodging facility.